The Netherlands is considered a low country because it is below sea level, meaning that its people have had to take extraordinary measures over the centuries to keep it from flooding. Travelers to the Netherlands today can see the results of this work in the dykes, the canal system and the thing most synonymous with the Netherlands, the windmills. Just north of Amsterdam is the Zaanse Schans a large open air conservation area that celebrates the Dutch way of life in the 17th and 18th centuries. Here you can find the highest concentration of windmills in the country (although they are found throughout the land) as well as shipyards, a dairy farm, pewter factory and clog making demonstrations. 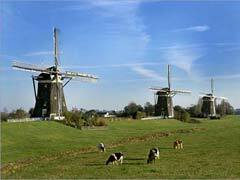 Netherlands tourism not only relies on the windmills, but also the large cities with the varied architecture and attractions. Amsterdam is the capital city and aside from its famous Red Light District, is famous for the series of canals that ring the area. Four concentric half circles end in IJ Bay and help keep the city safe from flood waters; each have names and are tourist attractions in their own right. For history buffs, Anne Frankhuis is a look into the life of Anne Frank, the teenager who hid with her family from the Nazis in WWII. For art lovers, the Van Gogh Museum is a must, boasting the largest Van Gogh collection in the world, with over 800 pieces spanning his career. While traveling to the Netherlands, why not find out about the history of Heineken? The Heineken Experience lets you do just that while enjoying a sample or two. For a quiet moment, head over to the Begijnhof. A gentle respite from the busy city, this collection of quaint houses are arranged in a courtyard with gardens and benches to sit and enjoy the views while seeing traditional Dutch architecture at its best. Tourism in the Netherlands also gives the traveler a great sense of history, like the Het Grachtenhuis, a museum housed in a lovely canal side home featuring the story of how they built the city with over 400 years of history to discover in displays and video presentations. The Museum Van Loon is a look back into the past in a preserved house once owned by the Van Loon family, a wealthy family in the 18th century complete with carriage house and gardens. Netherlands travelers in Amsterdam can partake in Rhine River cruises that also travel into neighboring countries and let the vacationer see city views, art museums, tulip displays and scenery you just can’t get anywhere else. The cruises vary in duration, price and ports of call, with many lines offering excursions along the beautiful waterway. Rotterdam is a city that was decimated in WWII and has been rebuilt in the years since. Netherlands tourism of a different sort is found there, as the buildings are a lot more modern than those found in other areas. The Euromast is the highest tower in the Netherlands, and at 100m tall it offers spectacular panoramic views from its observation deck. The one remaining later-Gothic style building left in Rotterdam is the Grote of Sint Laurenskerk, a cathedral that dates back to the 1400-1500’s. This beautiful old building is a tourist attraction because of its history and mere fact that it survived the bombings in the war. In its architectural style, it allows for an interesting background for the newer more modern buildings that surround it. Rotterdam’s City and Harbourwalk allows travelers to the Netherlands a chance to walk around the harbour and city center where an eclectic mix of architecture blends with the boats, footpaths, bridges, scenery and history of the area. Just 25 km outside of Rotterdam is Kinderdijk, the World Heritage designated site that boasts 19 windmills and wonderful photographic opportunities. Built around 1740, this area was one of the first ‘industrial’ areas in Holland, as the windmills were used to grind grains, drain water and contribute greatly to the needs of the people. The town of Schiedam shows tourists to the Netherlands some of the largest windmills in the world, with their 5 huge mills that tower up to 33 feet high. The De Nieuwe Palmboom windmill also serves as a museum teaching the history and purpose of the windmills, with picturesque landscapes and that Dutch atmosphere that has made the Netherlands a popular tourist destination. 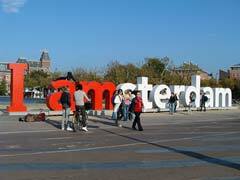 Netherlands tourism is helped by its proximity to major centers and many other countries. People wishing to travel on to the UK or come to Holland via the UK have ample opportunities with the ferry systems that are in place. Many lines offer ferry service and have many different runs. For example, one ferry will take you from Newcastle to Amsterdam in 15.5 hours, another runs from Hull-Rotterdam and takes a little less than 11 hours to complete. Others take as little as 7 hours as they travel the North Sea. 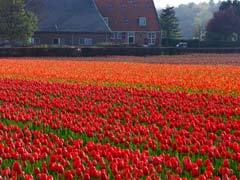 For beautiful tulip gardens, the windmills and the beautiful architecture of a bygone era, the Netherlands is a lovely vacation destination, just waiting to be explored.